Vitamix 7500 Review - How does it compare in 2019 ? Vitamix 7500 Review – How does it compare in 2019 ? Vitamix continues to introduce a lot of blender models and the Vitamix 7500 is part of their next-generation G series blender line. The big question is how does the Vitamix 7500 compare with other Vitamix models and is it the best choice for you ? In this Vitamix 7500 review I give you all the facts to help decide if it is the best blender for your needs. Let’s get started ! The G-Series, which is short for “Next-Generation”, product line offers Vitamix’s most powerful motor as well as a unique design that dampens motor noise by as much as 40% compared to previous Vitamix models. The G-series product line was introduced in 2013 and the 7500 is the base model. The other G-series models are the higher priced 750 and 780 which offer more technology features. The 7500’s powerful 2.2 horsepower motor is a step up from the older models that use 2 horsepower motor. The G series models also have a new airflow and internal cooling system to help reduce noise and overheating. Besides the new sleek design, the most visible difference of the 7500 and G-series blenders is the wide, low-profile container. Vitamix blenders are commonly recognized for the tall narrow containers which work well but prevent the blender from fitting under a kitchen cabinet. The G-series low-profile container are about 3 inches shorter and allow for easy storage under a cabinet. The new low-profile containers have a wider base that integrates with a longer 4 inch blade compared to Vitamix’s traditional 3 inch blade containers. The wider 4 inch blade works especially well with thick recipes and food prep like chopping. The Vitamix 7500 comes with a 64oz container but is also compatible with the following containers: 32oz, 48oz, and 32oz dry grains container. It also comes with a tamper, Getting Started DVD, and professional Vitamix recipe book. The 7500 features an incredibly powerful, 2.2 HP motor. It is plenty of power for any blending task. It is the same motor that is used on the more expensive Vitamix Pro 750 which is the #1 rated blender by Consumer Reports. Also, the new G-series internal design allows this motor to perform longer without overheating. A distinguishing aspect of Vitamix motors is that they have high torque and wide range of speeds. The true range in speeds is one of the more important features of Vitamix blenders versus other high powered blender brands. The distinguishable range from low to high is really important when you don’t want to puree everything that you put in the blender. The 7500 uses Vitamix’s ever popular 10-speed variable control dial. The dial on the 7500 is larger than older models and easier to turn. There are no preset blending settings on the 7500, but there is a pulse function which helps not only during the cleaning process, but also in food prep where you don’t want to puree the ingredients. There is also an on/off master power switch on the right side. The Vitamix 7500 can be used for a wide variety of kitchen tasks, including blending, mixing, chopping, creating purees, making hot soups, and, of course, probably the most popular way of using it, making smoothies. Regardless of the density of the ingredients (no bones allowed of course) the 7500 does a quick efficient job and blends everything in a matter of seconds. In combination with the wider low-profile containers the 7500 does especially well with tasks like making nut butter, crushing ice, and blending thick recipes. Do You Need Presets ? Many people wonder if it is worth paying more for a Vitamix model with preset blending programs. It is important to understand that the presets are just timed blending programs and don’t adjust for what or how much you are blending. The presets might be useful if you just follow a recipe where you want to be hands off for certain blending tasks. On the other hand, the presets are designed for specific container sizes and volume of ingredients so they won’t be as useful if you make any changes to the recipe or container size. Overall, it comes down to personal preference. Presets can be convenient for some tasks but you pay more to have them. They aren’t needed and many consumers do fine without them. Positives: The Vitamix 7500 is the most affordable G series Vitamix model and is a nice update to the popular C-series product line. It is a great choice if you want all the best features of Vitamix’s new design and don’t want to pay for the extra cost of preset blending programs and digital technology features. The 7500 has simple to use controls with Vitamix’s classic variable speed control dial. It is quieter than older Vitamix blenders and uses the new low-profile containers. Comes with Vitamix’s amazing 7-year full coverage warranty. Negatives: The 7500 doesn’t offer any preset blending functions (presets are only available on G-series 750 and 780 models) which some people like having. The 64oz low profile container that comes with the Vitamix 7500 can struggle at properly blending small batches compared to the traditional tall Vitamix 64oz container. 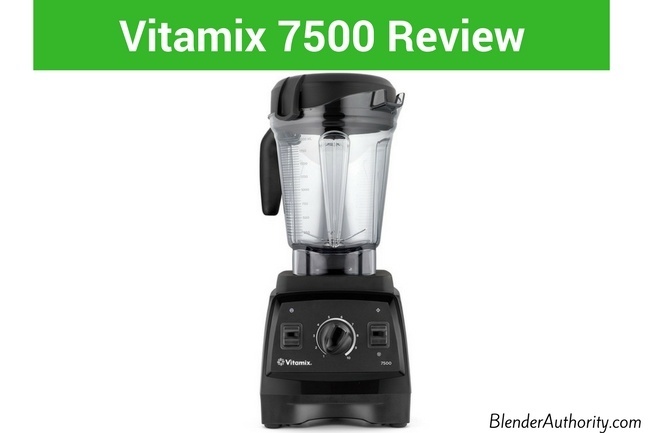 Overall Opinion: The 7500 is an excellent model and one of our favorite Vitamix models. It is a workhorse that can handle any task and offers the same performance as their higher priced 750 and 780 models. The 7500 ranks highly in multiple independent blending tests and consistently has very high user reviews at top retailers like QVC, Costco, and Amazon. The only small negative is that the 64oz low-profile containers don’t blend small batches as well as the traditional tall Vitamix containers, so you might need to buy a smaller 32oz or 48oz container in the future if you find yourself making small batches. 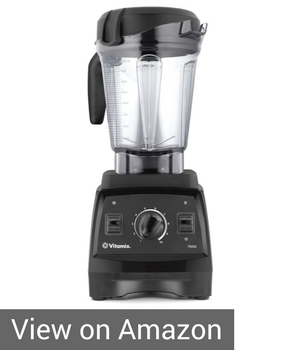 -> Click Here for Vitamix 7500 Current Price. What is the Vitamix 7500 Blender Super Package ? The Vitamix 7500 Super Package is created for Costco. It comes with the standard 7500 blender with 64oz low profile container but adds in a 32oz dry grains containers and two 20oz to-go containers. The Costco 7500 super package costs $599 so you are paying more to have the extra containers. If you don’t feel that you will be grinding flour or making dough then you can save yourself about $100 by purchasing the standard Vitamix 7500 with 64oz container package without the dry grains container. The Vitamix Pro 300 is the same blender as the Vitamix 7500 but the Pro 300 comes with a bigger cookbook called “Create”. Despite being the same blender, the 7500 is sometimes priced slightly less. The Vitamix 5200 is the base model of the C-series line with the same controls as the 7500. The 5200 has a slightly weaker motor than the 7500 but the performance is similar between the two models due to the different containers. The 5200 uses the C-series narrow tall pitcher and therefore handles smaller batches better than the 7500’s wide low-profile containers. Although the wider base of the low-profile containers allow it to chop and perform food processing better. The 7500 is slightly quieter with the new base motor design and is a nice update to the 5200 if you prefer the wider low-profile containers. The only other difference is that the speed dial on the 7500 is larger and a little easier to turn than the dial on the 5200. Overall, both are great models. The different jars each have their own specific advantages but each blender provides similar performance. The 7500 costs more due to it having the newer design and features. The 5300 is a hybrid model in that it is built on the C-series base but uses the new 2.2 horsepower motor found on G-series models. Both models use the same G-series low-profile wide container with 4 inch blade. Performance is very similar between the two models but the key difference is that the 7500 is built on the new Gseries base with the new airflow features for improved cooling and noise reduction. When deciding on the Vitamix 5300 vs 7500, most people would just choose the updated 7500. See our Vitamix 5300 review for more details. The Vitamix 6300 is the C-series 5200 blender with 3 preset blending programs. Reference the 5200 vs 7500 comparison above for more details. The 6300 is decent if you like the ever-popular C-series 5200 with tall container and want presets. See our Vitamix 6300 review for more details. The 7500 has slightly more power and the latest design features of the next-generation models. Get the 7500 if you want a G-series blender and low profile container. The 6500 is the same as the 5300 but adds in 3 preset blending programs. See the Vitamix 5300 vs 7500 comparison above for more details. Like the 5300 comparison above, the 6500 is hybrid model that is built on the C-series base but uses a more-powerful G-series motor. The 6500 adds in 3 preset blending programs to its controls. Both the 7500 and 6500 use the same low-profile wide containers. Blending performance is similar between the two models. When comparing the two models most people just choose the 7500 over the 6500 simply to get the new G series design and noise dampening. For pricing the 7500 is only a little bit more than the 6500. 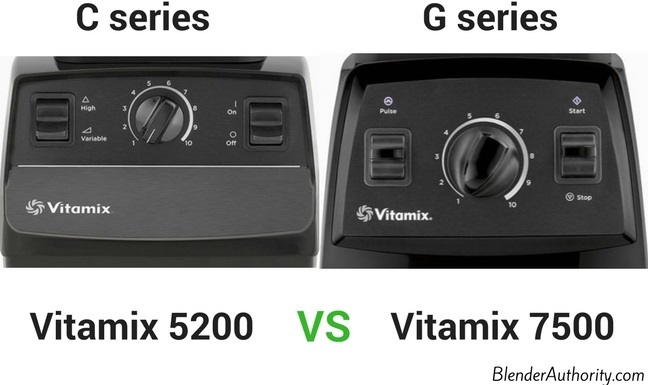 If you want the 7500 to have preset blending functions like the 6500 then get the G-series Vitamix 750 (See comparison below). The Vitamix 750 and 7500 are the exact same blender but the 750 has 5 preset blending functions (soups, smoothies, frozen desserts, puree, and self cleaning). The other difference is that the 750 has additional “Metal finish” color choices. The Vitamix 750 is Consumer Reports top blender choice in its most recent blender test. The performance between the two models is the same so it really comes down to if you want the preset functions and additional color choices. Both models are excellent but the 750 will cost about 15% more to have the presets. See our Vitamix 750 review for more analysis. The 7500 has a slightly more powerful motor than the Blendtec Designer blender, capable of reaching 37,000 RPMs as opposed to the 28,000 RPM capacity of Blendtec. A: NO. Do not put the container into the dishwasher because it can warp. Also it will void your warranty. A: The 7500 can easily grind the meat, but removing all the chunks may be problematic without adding water and using the pulse function. A: Yes, the 7500 is excellent at crushing ice especially due to the wide container. (It was chosen as the best blender for crushing ice). The Pro 750(same blender as 7500) has the highest rating in Consumer Reports ice crushing test. Q: Should I consider a vitamix 7500 refurbished model ? A. The factory reconditioned models are “like-new” and the 7500 refurbished will save you about $120. The only difference with reconditioned models is they have a 5 year warranty versus the 7 year warranty on new models. Generally, Vitamix reconditioned models are a great deal. Click here for price on Reconditioned 7500. The Vitamix 7500 is a powerful,top-of-the-line blender with the best of Vitamix’s innovations. It offers a nice balance of new features for the price and is a top choice among testers and consumers. When it came out in 2013, it was one of the best blenders on the market, and it still holds up today. If you are still confused by all the Vitamix models then read our comprehensive Vitamix buyers guide where we discuss everything you need to know. Please leave any questions in the comments section below. We answer every question ! I live in the UK and would like to purchase a Vitamix 7500, but can not find one. If Vitamix is not available here, then which brand would you have me look into? PS; great job reviewing and presenting your findings. I think I’ve decided on the G-series 7500 for one of my children, but I recognize the need to buy a smaller container to go with it as well. I was wondering if I should get a 32oz or a 48oz to supplement the 64 oz low profile? I personally have had my C-series 5000 for well over ten years and I love it but I’ve always recognized how hard it is to get everything out of the container, which is why I’m going with the low profile, 4 inch blade for my child. I love my old 5000 because it truly is a workhorse (I use it 4 or 5 or 6 times a day for everything!) and yes, it does small batches, but it seems silly to not get my own daughter a Next Generation, since it’s available. No presets are needed! Please let me know whether the additional container should be the 48oz or 32 oz. I’m worried that the 32 oz might actually be too small or that the 48oz still won’t be small enough to make up for the wide base. Thank you for your comprehensive website! Hi Stacy, most people go with the 48oz when you are pairing it with 64oz low profile container that comes with the 7500(or any of the low profile blenders). The 32oz is a nice combination with the C-series 64oz tall and narrow container but the 48oz is a good combination with the Gseries low profile containers. (Ascent doesn’t even offer the 32oz container and just the 48oz container because it is more popular and versatile). Let me know if you have any other questions.